Vauxhall Gardens, alongside London's Thames River, opened in 1661 as a pleasure garden, an urban greenspace whose patrons paid a small entry fee to enjoy walks, informal refreshments, and entertainment. The name "Vauxhall" was later given to tea gardens in New York, Philadelphia, and Charleston. Charleston's first Vauxhall was a concert and dining venue on Broad Street, opened in 1795 by "Citizen Cornet." His first evening's program included an orchestra playing French music, supper, and refreshments. Tickets were $2 "for each gentleman, accompanied or not by ladies." Throughout the winter social season, Cornet held a ball and supper every Friday evening, occasionally offering the diversion of a masked ball. Although the building he leased was unscathed by the fire that ruined much of Broad Street in June 1796, Cornet gave up the business. While he returned to his primary trade, tuning and repairing harpsichords and pianos, restaurateur William Robinson took the "large and commodious House in Broad Street, No. 44 (commonly called Vaux-Hall)" and reopened it as a gentlemen's dining room and tavern. The name Vaux Hall was revived with the establishment of a pleasure garden at the northeast corner of Broad and Friend [Legare] streets. Opened on June 24, 1799, Vaux-Hall Garden was the enterprise of Alexander Placide (1750-1812), a French-born dancer, acrobat, actor, tightrope walker, and theatre impresario. With his wife, the English-born singer/actress Charlotte Wrighten, Placide managed a troupe that performed first at the French Theater on Church Street, then after 1800 at the theater on Broad Street. The city's resident acting company also traveled regularly to other southern cities, and to northern resorts in the warm months when Charleston's theater was closed. Vauxhall [it is written differently in various newspaper advertisements] Garden was a summer evening venue, initially providing simple pleasures: "The illumination… will receive a considerable addition. Benches and other convenient seats will be put in every proper point, and cold suppers prepared at a minute's warning. The doors will open at half past seven and be shut at eleven o'clock. Price, half a dollar. No admittance for people of color" (South-Carolina State Gazette July 1, 1799). During the course of the summer, Placide began offering concert programs at Vaux-Hall, presenting theatre vocalists who remained in Charleston through the off season. He improved the facility during the next winter, and when the garden opened for the summer in May 1800, he promised that "the days on which there will be no Vauxhall, the garden will be illuminated for those ladies and gentlemen who wish to take ice cream and refreshments until 10 o'clock in the evening." Upgrades were an annual occurrence. 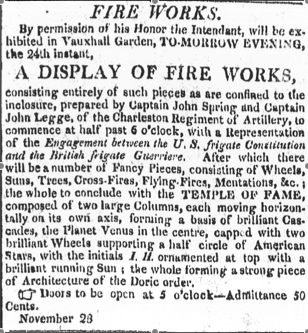 In 1801, evening musicales culminated in fireworks. In 1802, Placide contracted a complete small orchestra, who offered regular concerts with singers from the Charleston Theatre's retinue. In 1804, he installed bathing facilities, with warm or cold baths. Alexander Placide died in New York in the summer of 1812, having opened Vauxhall Garden for the season on March 26th. The bathing rooms had been repaired, and were open daily from 6:00 AM to 10:00 PM. Baths were 50¢ apiece, discounted for regular patrons at three for a dollar. These rates were unchanged over the next decade, while several different proprietors carried on the Vaux Hall bath, garden, and entertainment businesses separately. A few months after Placide's death, "Messrs. Pepin and Breschard, Managers of the New York, Philadelphia and Baltimore Circus, lately known by the name of the Olympic Theatre," began constructing an amphitheatre in Vaux-Hall Garden. It was complete by early December, with entrances on both Broad and Queen streets, box seats and inexpensive standing room in the pit. Highlights of Pepin and Breschard's first show were eight-horse cavalry maneuvers, daredevil riding by ten-year-old Master Charles, and "Mr. Bell (from the Theatre Royal, London)" as a clown, performing a variety of feats of buffoonery and horsemanship. The evening concluded with fireworks exploding around the "incombustible horse Tyger." Mrs. Placide operated the Vauxhall property for only a few seasons after 1812. In February, 1816, the land, amphitheater/stable building, and other movable fixtures were sold at auction. During subsequent years, although the land was resold several times, the baths on the corner of Broad and Friend street continued to open every spring. Finally, in 1821, the Right Reverend Dr. John England, Roman Catholic Bishop of Charleston, purchased the property for the diocese. Today's Cathedral of St. John the Baptist occupies the site of Vauxhall Gardens. The old circus site was refurbished after the Charleston Theater on Broad Street closed in 1832. Theater manager Charles Young installed a removable stage and proscenium, promising "to introduce an equestrian company in addition to the regular entertainments." Irish actor Tyrone Power referred to this playhouse as a "barn" when he played in Charleston in November, 1834. Butler, Nicholas Michael. Votaries of Apollo: The St. Cecilia Society and the Patronage of Concert Music in Charleston, South Carolina, 1766-1820. Columbia: University of South Carolina Press, 2007. "The New Theatre." Southern Patriot May 29, 1832; June 5, 1832. Rogers, George C., Jr. Charleston in the Age of the Pinckneys. Norman: University of Oklahoma Press, 1969. South-Carolina State Gazette, various dates. 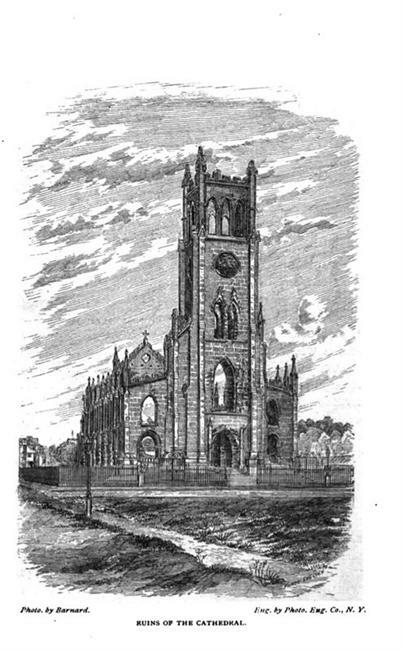 The Cathedral of St. John the Baptist and St. Finbar was ruined by the great fire of 1861. 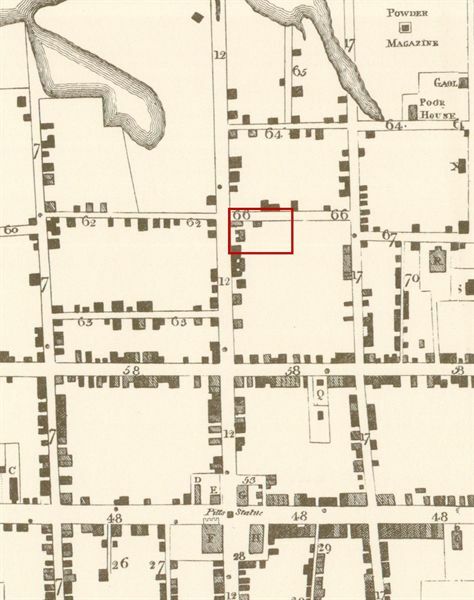 1788 map showing dwelling that had burned by 1799. 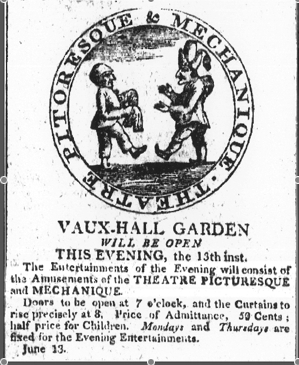 Alexander Placide opened Vauxhall Gardens on the grounds of the residence.